The Lafayette Times is the official news source for Lafayette High School in Lexington, Kentucky. We here at the Times are committed to providing reliable news relevant to the student body of Lafayette as well as parents, teachers, alumni, and the Lexington community. Congratulations to Singers, Advanced Women, Chorale and Madrigals for outstanding performances at KMEA Assessment on March 13, 2019. All groups received distinguished ratings. Each choir performed 3 pieces, received a 15-minute clinic by a choral adjudicator, and demonstrated sight singing skills. In addition to their overall performance ratings, each choir received distinguished ratings in sight-singing. Singers: "Great Rep!!" "Lovely tone on Zion - free"
Adv. Women: "Best facial expression today" "Electric - your tone blend/balance is the success behind your intonation!!" Chorale: "Wow! Lovely tone!" "Vital emotional involvement"
Madrigals: "Just a joy for the ears!" "Wonderful communication to audience and within your ensemble." The Lafayette Madrigal Singers gave an outstanding performance that garnered a first-place win in the Margaret Comstock Chamber Choir Competition on Friday February 22, 2019. The event is held at the School of Music on the University of Louisville campus in Margaret Comstock Concert Hall. The event is hosted by the world-ranked University of Louisville Cardinal Singers. This is the twelfth time the Madrigal Singers have won first place at this event. The group competed against twelve other choirs from top choral programs in Kentucky. This competition demands high-quality repertoire selections and outstanding performance from ensembles. Each choir is required to sing one common piece that is selected as the compulsory piece each year. Choirs compete in two rounds for a panel of judges and clinician. After the first round performance, choirs received a clinic session coached by Dr. Kent Hatteberg (Director of Choral Activities at the University of Louisville). The competitors are narrowed to three choirs that compete again in a second round for final placements. Adjudicators for the event were Dr. Michelle Louer, Director of Music and Fine Arts at Second Presbyterian Church in Indianapolis, Indiana, and Dr. Philip Copeland, Director of Choral Activities at Samford University in Birmingham, Alabama. “Masterful work – really tremendous on so many levels.” - Dr. Philip Copeland, Samford University, Birmingham, Alabama. The Lafayette Madrigal Singers have been chosen to perform a featured concert at the bi-annual conference for the Southern Division of American Choral Directors Association in February 2018 in Louisville. It is a tremendous honor to be selected to perform for this region's choral professionals. This is a very selective invitation and was made possible by audition tape based upon three previous years’ performance recordings. We are very proud of this accomplishment and the alumni whose outstanding past work made this invitation possible. Lafayette Madrigal Singers were selected as one of five high school choirs. Only 19 choirs were selected from among 90 applicant choirs. We are one of only four high school choirs in Kentucky to have ever performed at a national or divisional ACDA convention and we are one of only two Kentucky high schools to have been invited twice. For high school, college and even professional choirs, an ACDA performance is one of the highest honors a choir can receive. There were only nineteen performing choirs selected of which, five are high school choirs. To be recognized and awarded a performance slot is greater than winning a state-level contest. 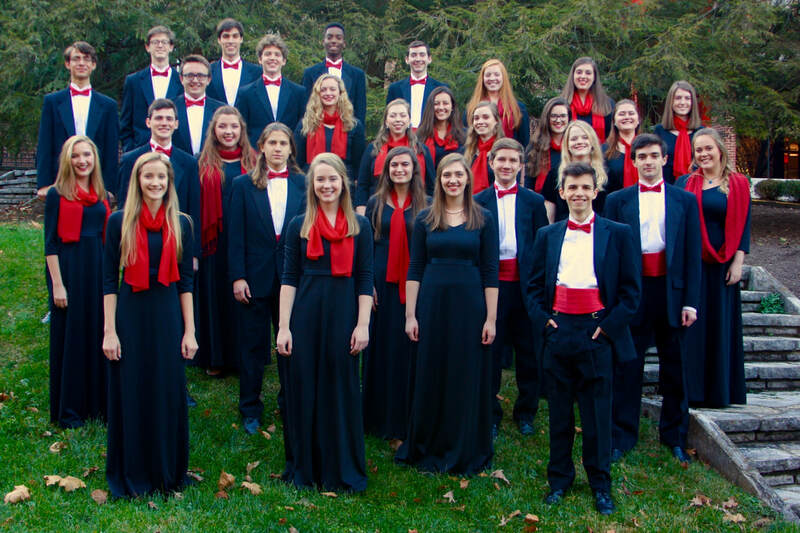 ​The Madrigal Singers are state, nationally, and internationally recognized. Lafayette Madrigals are an advanced chamber group made up of mostly juniors and seniors. The choir last performed for ACDA in 2010 in Memphis. The group performed for the KMEA conference in 2009 and 2015, and was awarded two silver medals at the World Choir Games in Cincinnati in 2012. The choir won a gold diploma and the mixed youth choir category in the Sing ‘N’ Joy International competition in Louisville in 2014. The choir competes annually in the University of Louisville Chamber Choir Competition and have won first place ten times since 2004. On Sunday, February 11, Fox News morning show, Fox and Friends, contacted KMEA who referred them to several Lexington choir directors. Through the weekend, Fox and Friends had been airing the the viral video of KMEA All-Staters singing the National Anthem at the Hyatt. They wanted to do a follow up location shoot with Kentucky all-state singers. All-Staters from Lafayette, Tates Creek, Scott County, East Jessamine, Bryan Station and Lexington Christian Academy gathered in Lafayette Beeler Auditorium on Monday morning for a remote segment. The news station sent a satellite truck and camera crew to film the students. Lafayette student Abby Holthaus, and Scott County Choir Director, Brent Merritt were interviewed about their experience at All-State.